When last I wrote, the paragraphs were mainly filled with minor disasters and entertaining tribulations. The scenery and human interaction made the experience sort of whimsical or maybe the least bit heartwarming. Some chronological overlap exists between the last blog post and this. But it’s for your own good. So, in the spirit of introduction, I begin with– If you liked that: You’re going to love this. Wendover never quite left the back of our minds. We had entrusted our beloved, albeit incapacitated, Gloria Southwind to the care of a “mechanic” whose business address was the back-corner room of a “weekly rates available” motel complex. It was that agonizing sort of suspicion when you’ve left your sunglasses at the house of an acquaintance; the uneasiness of hoping they’ll politely leave your forgotten belongings somewhere safe until your return. But in truth, you simply cannot count on it. We would come back for her in four days. She wouldn’t leave easily. Our first day was spent driving. Driving driving driving. We saw the sun from two states and the moon from a third. Our rented, white mini-van crept into the driveway of Robs Aunt Debbie and Uncle Bobs ranch style prairie compound around 2:45am. We were immediately welcomed by unexpectedly wakeful kinsfolk. The warm greetings were administered and we were shown to bed. The next night would be the first night of our Colorado concerts. According to the native wildlife, Merchants Mile High Saloon is owned and operated by a motorcycle club in Seattle. Or Portland. Or something. The party animal who gave us this information made sure we knew that, like us, he too was from California. His SF Giants hat and excessive use of the word “hella” were the only evidence I needed. Disembodied ship helms were hung on the wall at regular intervals. The lighting was red. The whole place was red. 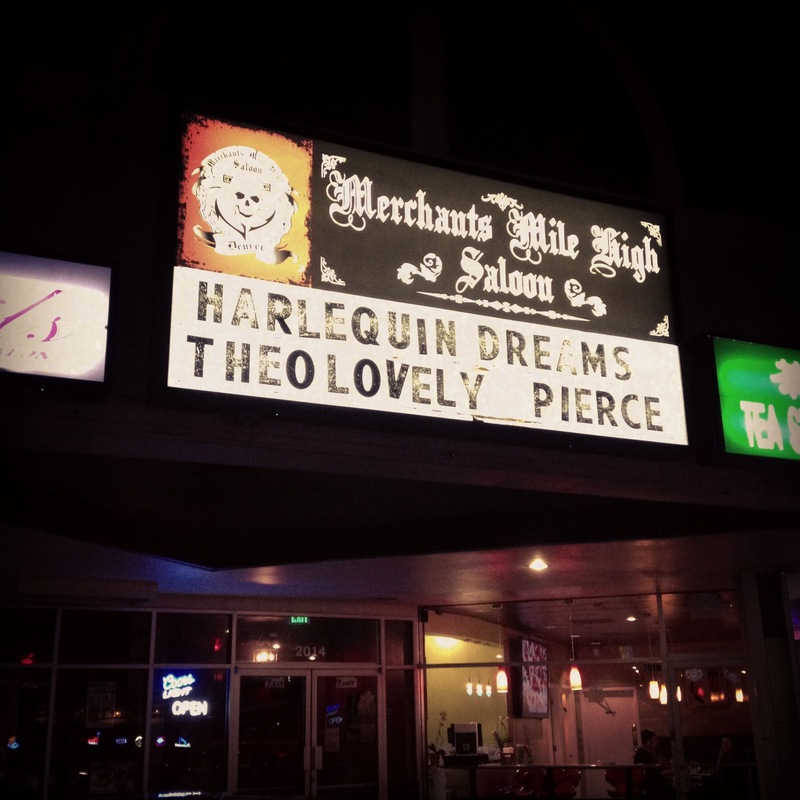 We were set to play first that night, then a heavy metal instrumental band called “The Pierce Project” then the pop rock quartet “Harlequins Dream.” Theodore Lovely was well received and we even sold a few CD’s. Overall the night was a success and we left having befriended the drummers from both bands. Drummers like us a lot. The next day we decided to go into Fort Collins and busk a while before our show that night. As a refresher for some of you, ‘busking’ is the act of playing music on the street. Robs cousin Oscar, our new best friend, took us downtown and gave us the tour of the best places to play. Downtown Fort Collins is a buskers dream. Little plazas and art installations, busy sidewalks and restaurants with out-door seating, painted public pianos every few blocks and little stages just the right size for our musical trio. It’s only appropriate that in a town built for music, we would choose the one spot in all of Fort Collins where we would be asked to leave half way through our set. 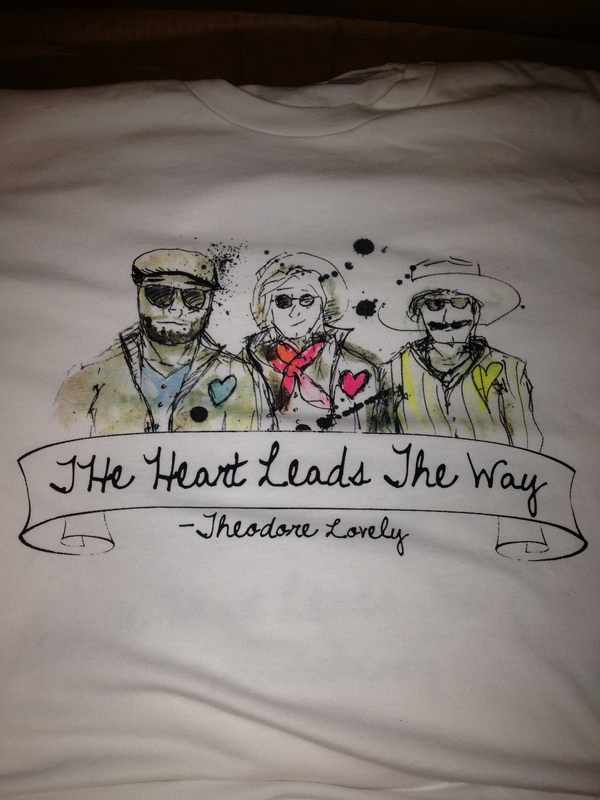 During a rousing rendition of the Theodore Lovely original “Heart Leads the Way,” our little crowd of enraptured audience began to split like the red sea. Mounting the curb across the sidewalk was a dark green astro-van pulling a monstrous silver trailer with the words “Pizza Casbah” emblazoned on the side. The van was struggling to summit the red curb and the roar of it’s poorly maintained motor was enough to evaporate the smiles from many of our biggest fans. We continued to play, ignoring the elephant on the sidewalk, inching forward and back, forward and back, jack knifing against a telephone poll, asking people to step aside and somehow maneuvering itself right up next to us. The song ended and a satisfying applause lingered. A bushy mustache leaned up against the van. “You guys thinkin’ of bein’ done soon?” His tone was polite. His delivery was insincere. Apparently we had invaded the prime locale for a combination pizza/gyro trailer operation. Out of all the places for us to sit down, between all the fountains, benches, plazas and stages, we had chosen the one spot where the only food cart we would ever see in Colorado was to be placed. We were polite and started packing up our instruments. Slowly. 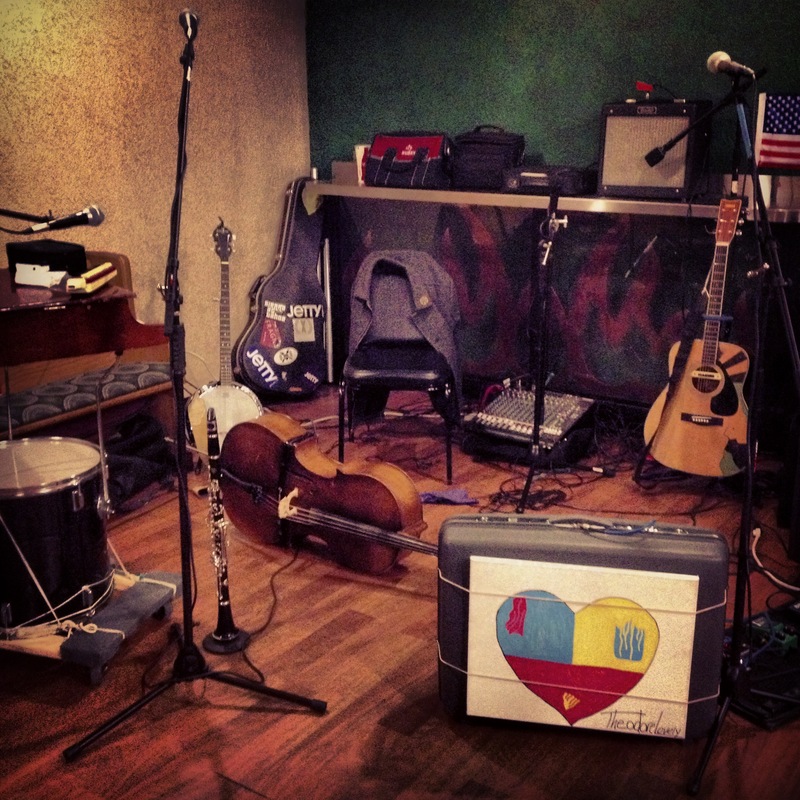 That night we played at a local get-fattery, aptly named The Fat Shack. The Fat Shack is own by Robs brother, Tom. When we arrived in the early evening we had the privilege of sampling some of The Fat Shacks finest Fat Sandwiches. A Fat Shack Fat Sandwich is an ingenious creation that was birthed by Tom and friends when he was a wee lad delivering late night sandwiches out of a bagel shop in lieu of a summer job. Fat Sandwiches are stuffed with things like onion rings, French fries, jalepenio poppers, cheese steak, fried chicken fingers, cheese sauce, ranch dressing, funnel cake, and the most important ingredient of all, love. Heres what the corner of The Fat Shack looks like with all our junk in it- A note to any future musicians to play at The Fat Shack: If you eat a Fat Sandwich before your set, be ready for a surprise horn section. (FART JOKE WHAAAAT?!) Anyhow, as the local population consumed enough calories to supply a trip to the Antarctic, we tinkled, strummed and plucked our way through their ears and into their hard working hearts. After all that, Tom and Oscar took us out on the town. We had heard nothing but praises about the night-life in Fort Collins. I won’t deny any of it. 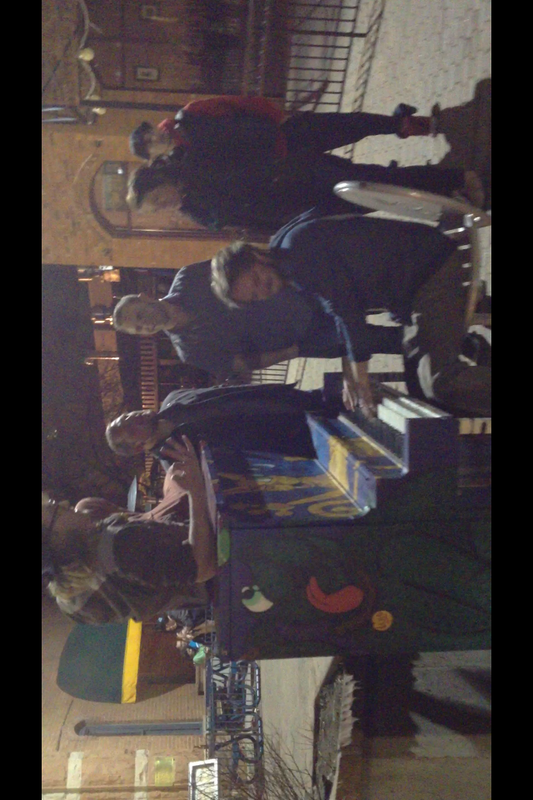 Between the Irish car bombs and the public pianos, Theodore Lovely gave Fort Collins a bona fide hoe-down. 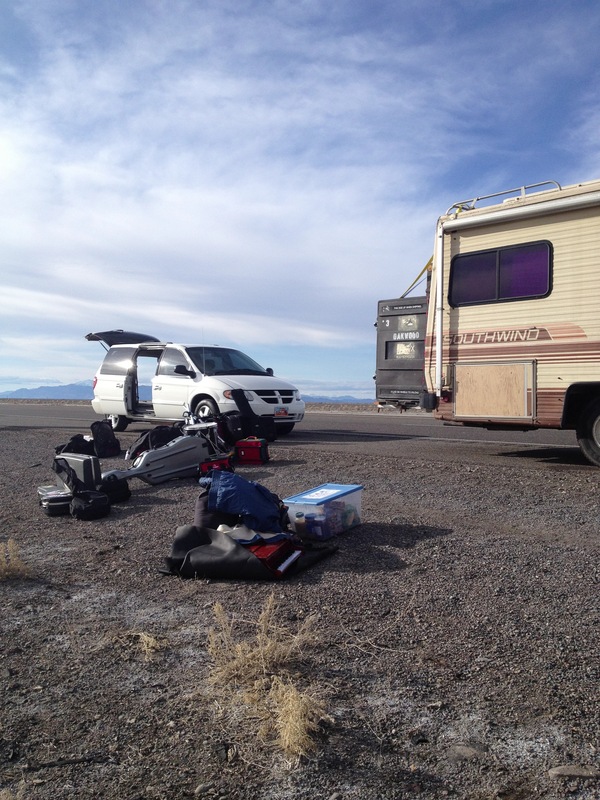 The next day we packed up the mini van and set off to rescue our dear damsel, Gloria, from the clutches of her captor, Wendover. Stay tuned for another Big Ol’ Blog post to find out how that went. Here’s a hint – Not good. P.S. We’ve just received the coolest shirts in the world. Our most beloved sponsor, Jetty at JettyLife.com, printed these beautiful babies. You kickstarter homies will receive yours soon. 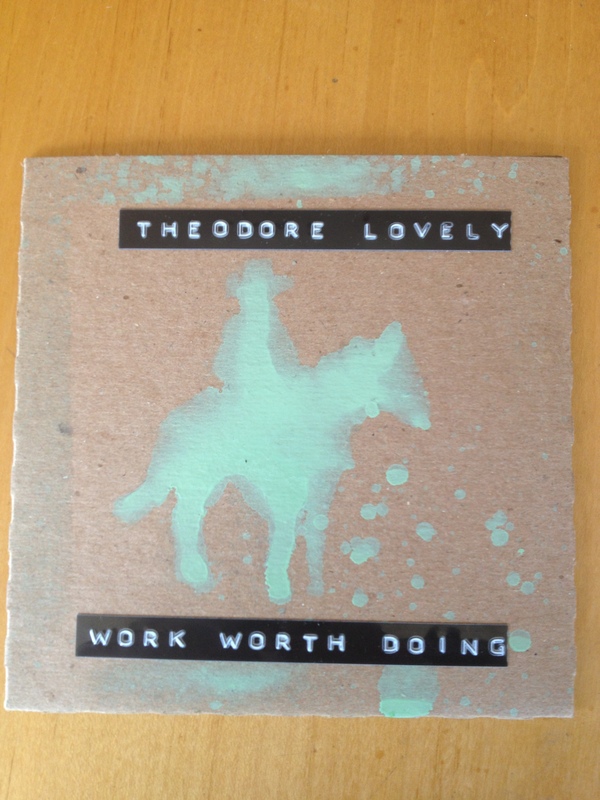 The rest of you can email us or get one at your local Theodore Lovely concert. I spy my goodie box!